By Chris Williams: Floyd Mayweather Sr. is extremely happy that his son Floyd Mayweather Jr (47-0, 26 KO) is finally facing Manny Pacquiao (57-5-2, 38 KOs) in their fight on May 2nd. The fight now gives Floyd Sr. a chance to show the world what he feels he already knows about Manny not being in the same class as Mayweather Jr. Floyd Sr. sees Pacquiao as fighter that is not as skilled as his son Mayweather, and he thinks it’s going to be a one-sided fight when Mayweather and Pacquiao go at it on May 2nd. Floyd Sr. is tired of the trash talking that has gone on back and forth over the years between him and Pacquiao’s camp. Now he just wants to see his son off the leash and attacking Pacquiao with shots to expose him in front of the world in their fight at the MGM Grand in Las Vegas, Nevada. “I’m as happy as I can be and come May 2nd, it’s here. The talking and [expletive] is over and we going to show the world what I have been telling you for years, and that’s that Manny “PacMan” Pacquiao is not on the same level as my son,” Mayweather Sr. said via Fighthype.com. It’s going to be bad if Mayweather defeats Pacquiao in a one-sided manner, because it’ll close the book on the two of them facing each other again. A one-sided mismatch will finish any talk of them facing each other again. They can’t fight again if the fight is going to be a one-sided mismatch, because the boxing fans won’t go for a second helping of another mismatch. The only way there can be a second fight is if it’s competitive or controversial, and I have a feeling that Floyd Sr. may be proven right that Pacquiao isn’t on the same level as Mayweather. To be sure, Pacquiao is on the same level as Mayweather in slugging it out. I don’t see Pacquiao as being better than Mayweather in slugging, but he’s at least as good as him in that department. 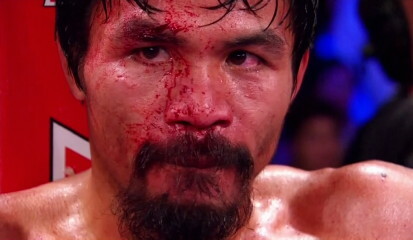 Pacquiao’s punching power is very overrated in my view, because he’s not been knocking anyone out for for many years, and that shows you that he’s not a tremendous puncher. He’s just a guy who throws a lot of punches to get victories. There’s no doubt that Floyd Sr. will be beaming with pride in the Mayweather corner during the fight if it turns out to be a mismatch. This will be one of the high points of Floyd Sr’s career because it’s not often that he gets the chance to see his son Mayweather Jr. dominate a fighter as well-known as Pacquiao is. It’ll also give Floyd Sr. a chance to gloat about the victory and talk trash to Pacquiao’s trainer Freddie Roach. For years Roach has been bragging about having the perfect game plan to defeat Mayweather, and now he’d finally been shown that he didn’t know anything at all. If Roach’s plan doesn’t work then he’s going to look and have to give Mayweather and Floyd Sr. their props.